"The market's still being driven by concerns about Iranian and Venezuelan supply," said Gene McGillian, director of market research at Tradition Energy in Stamford. "The failure of the producers to address that adequately this weekend is creating a buying opportunity." Brent crude <LCOc1> settled up $2.40 or 3.1 percent at $81.20 a barrel, after touching an intraday high of $81.39, the highest since November, 2014. U.S. light crude <CLc1> settled up $1.30, or 1.8 percent, higher at $72.08. OPEC leader Saudi Arabia and its biggest oil-producer ally outside the group, Russia, on Sunday effectively rebuffed Trump's demand for moves to cool the market. 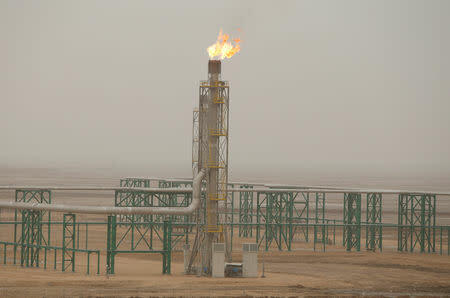 "I do not influence prices," Saudi Energy Minister Khalid al-Falih told reporters on Sunday. "This is the seventh time over the last couple of months that we have challenged the highs," he said, referring to individual monthly contracts, rather than a continuation contract. If Brent prices climb past $82 a barrel, he said prices up to $90 would be a near-term possibility. Some have said softening demand from trade tensions between the U.S. and China to offset loss of Iranian supply, but Tradition's McGillian said that unless trade tensions show signs of eroding Chinese demand, oil prices will surge further. U.S. commercial crude oil inventories <C-STK-T-EIA> are at their lowest since early 2015. While U.S. oil production <C-OUT-T-EIA> is near a record high of 11 million bpd, subdued U.S. drilling points towards a slowdown in output.